November, 2015 and a Thanksgiving week well never forget. 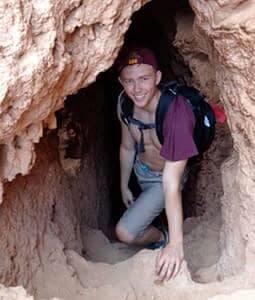 Our son, Austin, is a 19-year-old freshman at Arizona State University. Austins story is very similar to many on the foundation website. Austin is that kid that never really gets sick. Hes very athletic and never complains. In high school, he was a two-sport varsity athlete, swim and tennis. He likes to participate in various athletic oriented events, e.g., Spartan Races, Pat Tillmans Run, snowboarding. The photo is Austin this past summer (2015) hiking Grand Canyons Havasupai falls. We know weve been very blessed with so many to thank. Austin called home late Tuesday night, the week of Thanksgiving, complaining that he had severe heartburn, splitting headache, felt light headed, and couldnt sleep. During the conversation he stated that he had all the same symptoms the night before. He also shared that he felt fine all day and just got back from being out with friends and the symptoms were coming back. Of course, Im suspecting crappy food and alcohol most likely, a college kid with heartburn and a headache. I suggested over-thecounter relief items, etc. The next morning, Wednesday 8 am, Austin called home demanding a doctor with severe pain. Apparently college kids dont call 911… Austin called Uber. We didnt know whether to laugh or tear into him. It turned out to be the best $60 we ever spent, and one of the many blessings that saved his life. Austins mom is a nurse at Mayo Clinic Hospital and she was working that morning. So Austin headed to the Mayo Hospital and mom met him out front of the ED. He presented with heart attack symptoms severe chest pain (10of10) and shortness of breath. They wasted no time. A 12-lead ECG reflected ST elevation. The ED physician consulted with multiple cardiologists and they initially suspected pericarditis. His echocardiogram appeared normal. Steroids were started along with admission orders. A cardiac MRI that afternoon confirmed myocarditis! Additional testing pointed to the human rhino virus, a common cold virus. Steroids were adjusted along with an additional beta blocker and the next 3 days were spent with 24-hour telemetry and blood draws every 8 hours. Austins Troponin and CK MB were scary high. Heart failure was not out of the question. By Friday morning blood enzyme levels had dropped allowing Austin to go home but under strict observation and ZERO activity. One week later, the echocardiogram and blood work were normal. January 7th, 2016, Austins ECG was still abnormal showing ST elevation. His ejection fraction (EF) was good and blood work remained normal. Austin is back on campus and is doing much better. He still has shortness of breath occasionally and tires very easily. We realize were on a long and slow journey to what we pray will be a full recovery. Were encouraged by the stories of others.